Damen has already had great success with its SeaAxe superyacht shadow boats, and has developed this new concept that combines the rugged offshore capability of the shadow vessel with the comforts of a cruising superyacht. 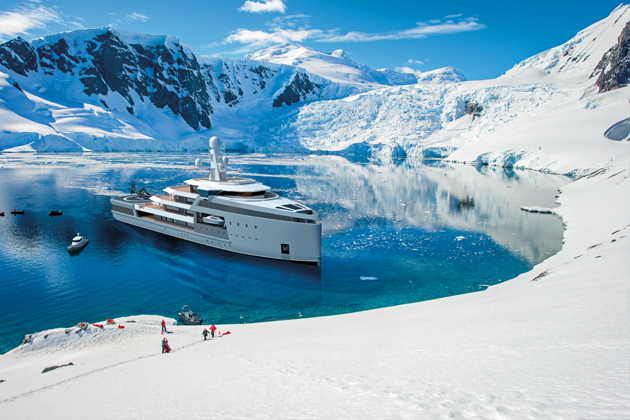 The shipyard has partnered with specialist long-range cruising curators Eyos Expeditions throughout the creation of the range. The yachts answer the increasing need of clients who want to venture to the furtherst reaches of the planet. “A number of experienced yachting clients approached us about adapting Damen’s professional vessels, so we knew from them that there were simply no globally capable luxury explorer yachts out there,” says Rob Luijendijk, managing director of Amels. The hull and exterior lines are the work of Azure Yacht Design & Naval Architecture. The outstanding feature is the ‘double acting’ hull – that knife bow is tried and tested as a way of cutting through big seas, while the stern has been configured as the yacht’s ice-breaking weapon. 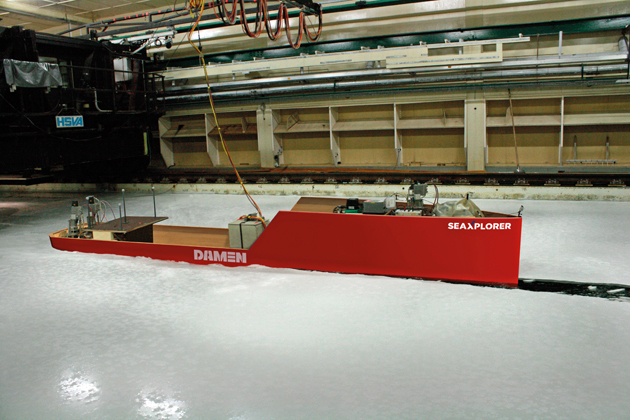 Damen has fully tank tested the concept. Interior design will be down to the client but initial renderings show a huge observation room and fire-pits on the aft deck. “It’s the synergy of Damen and Amels, the shipbuilding know-how, the deep understanding of superyacht lifestyles and the right experienced partners who understand luxury expeditions. It makes the SeaXplorer a very attractive project at an advanced stage, so we can have a real conversation with each client about what they want to achieve,” says Arnout Damen, chief commercial officer of Damen.